Whether you’re lucky enough to live near the beach or you just like to stay in shape while vacationing in paradise, hitting the sand and surf for a workout can be a fun challenge for your muscles – and you can build in a great sweatfest with no equipment! Make sure you’re wearing weather-appropriate clothes and shoes, slather on the sunscreen, and bring your sunglasses! If you’re on soft sand or in the water, you’re going to be using your muscles in new ways. Even if these are postures or moves you’ve done before, make certain that you go at a slower pace or at half-strength until you know how your body is going to react. Hydrate, hydrate, hydrate! You’re going to be in the sun and certainly will be dealing with more humidity than you normally would have in your air-conditioned gym, so be smart and safe. If you’re going to be working out in or near the water, please make sure you can swim – and it’s always a good idea to take a buddy to help in case you get a cramp or need assistance. When getting ready for a workout, it’s best to start with some dynamic stretching and to get some light cardio in so you gently raise your heart rate and core temperature. Just like in a workout at the gym or in a group fitness class, you want to make sure that your warm-up incorporates some of the moves you’ll be doing throughout the workout. 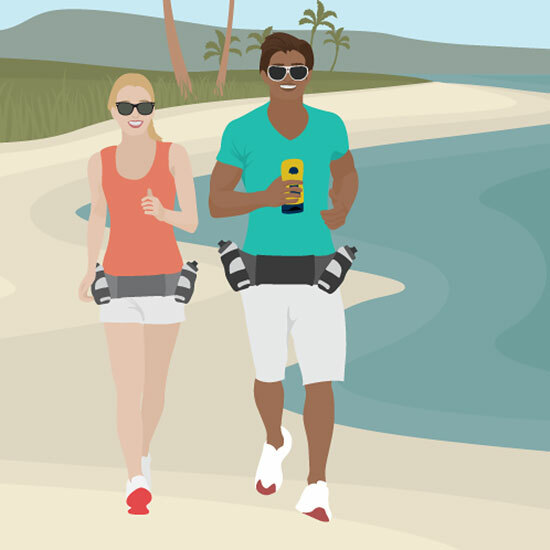 But, of course, when you’re on the beach, you’re battling even more challenges: an unstable surface, the sun elevating your core temperature more quickly, and visual and audio distractions that could prevent you from properly getting everything ready for the more intense workout that will follow. Marching in place (soft sand is okay, but finding a place with slightly wetter, harder-packed sand would be preferable). Arm circles and shoulder rolls. Walking lunges (with attention to knees – make sure your knees don’t go past your toes). Cat/cow stretches (rounded and flat back). If planning to swim, wade out into shallow water and do some light flutter kicks with your hands on the ground. Ah, the core. It’s not just about getting defined abs (although that’s a nice side benefit); having a strong core, plus flexibility on all of the adjacent muscle groups, helps you do everything better: walk, carry groceries, climb stairs, and more. Again, the beach presents some exciting challenges, and I promise that if you take your favorite core workout from the gym mat to the beach sand, you’ll feel it in some very different muscles! Planks are hard enough on solid surfaces – wait until you try them on sand! If you find the basic plank too easy, try a bird-dog variation: lift right arm and left leg until parallel with the ground – use your core to stay straight and stable, then switch sides. Be a superman/superwoman: lay in prone position (on your stomach) and gently lift your arms and head off the ground with arms fully extended; when stable, lift legs off the ground as well. In a seated position, lift legs and bend knees to 90 degrees; then, twisting at the hips, drop clasped hands from one side to the other, trying to get as close to the ground as possible. Listen, I love a good treadmill walk as much as the next gym rat. You can watch TV, read a book, have a nice even surface, and even a handy little timer that tells you when your time is up. But for intense cardio that feels more like playtime than worktime, I love going outside. And everything about cardio at the beach is more challenging (if you’re doing it right). 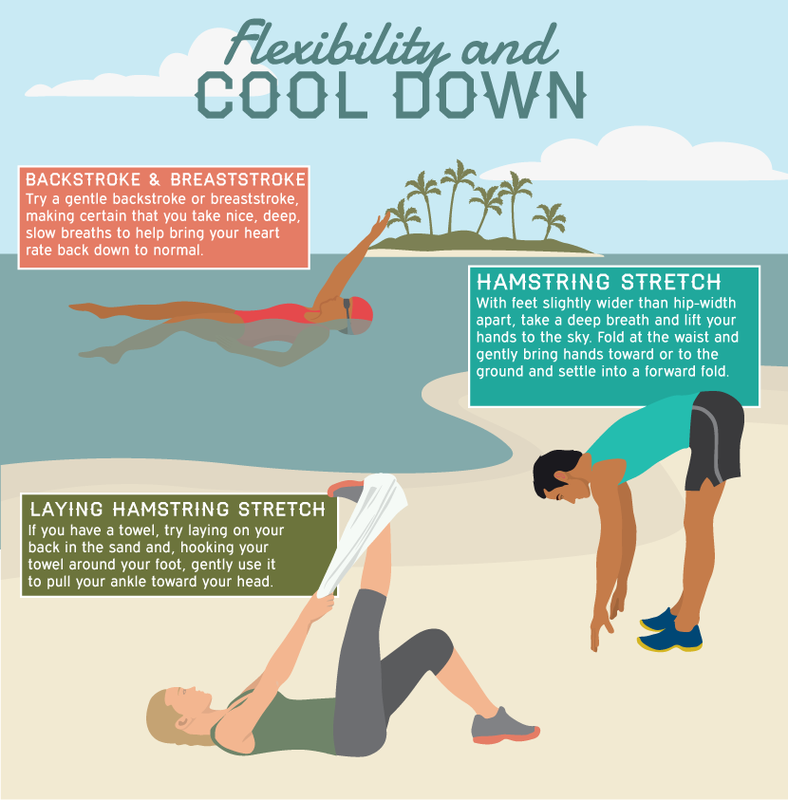 Regardless of whether you’re at the gym or on the beach, please do not skip your cooldown! You worked so hard to elevate your heart rate and core temperature in the warm-up and workout that it can be dangerous and ineffective to just stop. Keep in mind, too, that the sun will have taken a toll on your body’s core temperature and helped you sweat a bit more, and may have caused your muscles to work in a way that they’re not used to. Remember, movement is movement! So if you want to try to get a workout in that doesn’t feel like work, a few fun ideas to burn calories and increase your strength include playing beach volleyball, building sandcastles, collecting shells (try squatting down to pick them up instead of bending over! ), or even bodysurfing with the waves The beach is a fun and exciting place to be, but being there doesn’t have to mean you’re sacrificing your daily workout! Sprints (either choose a short distance and run from one side to the other or set a stopwatch for 15 seconds and run as fast and as far as you can). High-knee running in place (try doing ladders – start with 5 seconds, go to 10, 15, 20, and then back down to 15, 10, and 5). If you’re in the water, try bobbing up and down – squatting down in the water and then springing up as high as possible, catching yourself at the bottom and dropping back into a squat to continue the move. With feet slightly wider than hips-width, take a deep breath and, lifting hands to the sky (that’s where those sunglasses will come in handy! ), fold at the waist and gently bring hands toward or to the ground, and settle into a forward fold. If you keep your legs fairly straight, you should feel a stretch throughout your hamstrings, calves, and lower back. If you have a towel, try lying on your back in the sand and, hooking the towel around your foot, gently use it to pull your ankle toward your head, feeling a stretch throughout your lower body. If you’re in the water, try a gentle backstroke or breaststroke, making certain you take nice, deep, slow breaths to help bring your heart rate back down to normal.